Greek Cypriot industrialist and heavyweight European contemporary art collector, Dakis Joannou has brought together an all star team to create an interesting watercraft . Named “Guilty”, the 35 meter long yacht is decked out with sleek, interiors by Ivana Porfiri and a pop-art exterior design by Jeff Koons in the style of Roy Lichtenstein and camouflage design in the style of Norman Wilkinson. 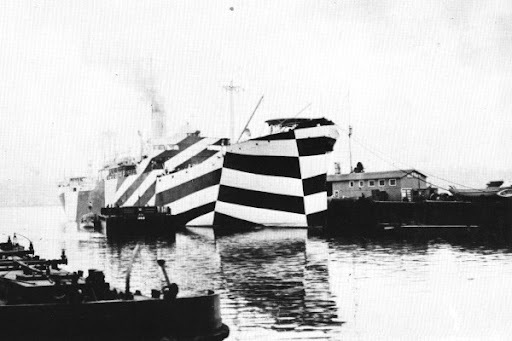 West Mahomet, a 12,225 tons displacement freighter built at Seattle, Washington, as part of the World War I shipbuilding effort, was completed in mid-November 1918, shortly after the fighting had ended. Turned over to the Navy at that time and placed in commission as USS West Mahomet , she transported flour from the West Coast to Constantinople, Turkey, between late November 1918 and early February 1919. Following return in the U.S. in early March, she carried Army cargo to Antwerp, Belgium. USS West Mahomet was decommissioned in early June 1919, soon after arriving at Newport News, Virginia, at the end of her second voyage. Transferred to the U.S. Shipping Board, she remained in the custody of that agency until abandoned in about 1933.